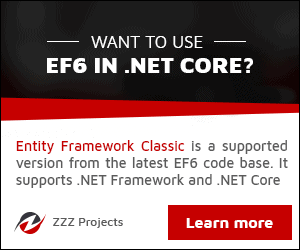 Here, you will learn how to write LINQ-to-Entities queries and get the result in Entity Framework 6.x as well as in Entity Framework Core. Visit LINQ Tutorials to learn LINQ step by step. The DbSet class is derived from IQuerayable. So, we can use LINQ for querying against DbSet, which will be converted to an SQL query. EF API executes this SQL query to the underlying database, gets the flat result set, converts it into appropriate entity objects and returns it as a query result. The following are some of the standard query operators (or extension methods) that can be used with LINQ-to-Entities queries. In addition to LINQ extension methods, we can use the Find() method of DbSet to search the entity based on the primary key value. Let's assume that SchoolDbEntities is our DbContext class and Students is the DbSet property. In the above example, ctx.Student.Find(1) returns a student record whose StudentId is 1 in the database. If no record is found, then it returns null. The above query will execute the following SQL query. EF 6 executes the following SQL query in the database for the above LINQ query. EF Core executes the following query in the database. EF builds and executes a parameterized query in the database if the LINQ-to-Entities query uses parameters, such as below. The above query will result into the following SQL query in EF 6. The difference between First and FirstOrDefault is that First() will throw an exception if there is no result data for the supplied criteria, whereas FirstOrDefault() returns a default value (null) if there is no result data. Use the group by operator or GroupBy extension method to get the result based on the group by the particular property of an entity. The following example gets the results grouped by each Standard. Use the foreach loop to iterate the group. Use the OrderBy operator with ascending/descending keywords in LINQ query syntax to get the sorted entity list. Use the OrderBy or OrderByDescending method to get the sorted entity list. LINQ-to-Entities queries do not always have to return entity objects. We may choose some of the properties of an entity as a result. The following query returns a list of anonymous objects which contains StudentId and StudentName properties. The projectionResult in the above query will be the anonymous type, because there is no class/entity which has these properties. So, the compiler will mark it as anonymous. The nested query shown above will result in an anonymous list with a StudentName and Course object. In this way, you can do a projection of the result, as you want the data to be.